Nagaur is located in the north western Marwar region of Rajasthan. It is an area with a forest belt of thorn scrubs that circles the Thar Desert. It’s surrounded by Churu District in the north, Bikaner District from the northwest andSikar District in the northeast. Pali lies in the south and Jodhpur District to the southwest and west. Jaipur is located on its east, while Ajmer is in the southeast. In the south eastern stretch of this district lies the magnificent Aravalli Range while India’s largest salt lake, ‘Sambhar Lake’ lies at the southwestern corner of the district. This city was known as Jangladesh in Mahabharata era. Its fort stands testament to the great battles and rulers who fought them. This town was granted to Raja Amar Singh Rathore by Mughal Emperor Shah Jahan. Nagas, Chauhans, Rathores, Mughals and even the British laid claim on this city. The dargah of Sufi saint Hamiduddin Chisti Faruqui Nagauri, one of the chief disciples of Khwaja Moinuddin, is also located here. Nagaur is also the birthplace of Saint Poetess Meera Bai and Abul Fazal. 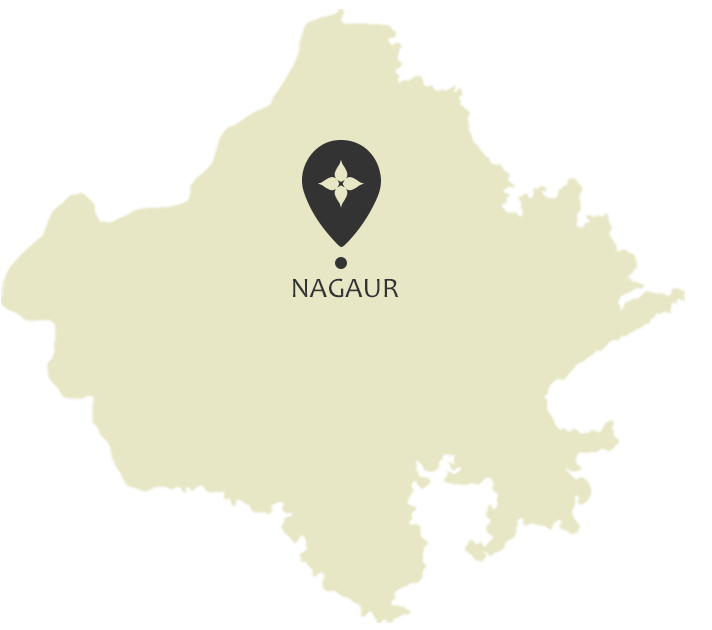 Come explore the wonders and sites that Nagaur has to offer. There’s always something to see in Rajasthan. It is said that Nagaur fort was initially built by ruler of Nag dynasty in 2nd century and was then rebuilt in the early 12th century. This fort has witnessed several battles and has also been altered multiple times. Being one of the first Mughal strongholds in North-India it is an outstanding example of Rajput-Mughal architecture. In 2007, the fort underwent major renovations and is now replete with fountains and gardens. It also serves at the stage for a Sufi music festival. Ladnun is an important centre of Jainism and is considered to be the spiritual hub of Ahimsa or compassion. Its temples were built in the 10th century and have a rich history. It also houses Jain Vishva Bharti University – a well-known centre of Jainism, spirituality and purification. It is said that the world famous rastra saint, Acharya Shri Tulsi belonged to Ladnun. It is said that the Nagaur fort was initially built by the ruler of the Nag dynasty in 2nd century, and this 500 year old fort, located on the eastern edge of the Thar Desert was built in about 1523. Mughal Emperor Aurangzeb used to stay at this fort. Black deer roam in herds around this fort. The fort has now been furnished with modern facilities and turned into a heritage hotel. Kuchaman city has many sights to offer. The most important is Kuchaman Fort, one of the oldest and most inaccessible fort of Rajasthan situated on top of a straight hill. It possess unique water harvesting system, a beautiful palace and stunning wall paintings. The rulers of Jodhpur used to mint their gold and silver currency here. It offers a beautiful view of the town and the salt lake. One can also see the old temple, stepwells and beautiful havelis in the town from here too. Khatu consists of two villages called Bari Khatu and Chhoti Khatu. Chhoti Khatu has a small fort on its hillock that was built by Prithviraj Chauhan. It also houses an old step-well called Phool Bawadi which is believed to have been built during the Gujara Pratihara period. It is a marvel of artistic architecture. Perched at a height of 300 metres atop a cliff, the Kuchaman fort in Nagaur district of Rajasthan is clearly the biggest attraction in the city of Kuchaman. This fort was constructed back in the 9th century by the Rathore ruler Thakur Zalim Singh. Surrounded by 32 bastions, the fort has ten big gates that allow entrance into the fort from different sides. This fort which once housed the entire city of Kuchaman within its boundaries has now been transformed into a luxurious heritage hotel for tourists. The Kuchaman Fort has also served as shooting spot for Bollywood movies, such as Jodha Akbar and Drona. Original inlays made of semi-precious stones and glass, motifs and flowers in gold and natural colours decorate the inner walls and pillars of this magnificent fort. The long balconies, hanging terraces and the popular miniature paintings of the Rathore clan are among the main highlights of this royal establishment. Ahhichatragarh Fort literally translates into "fort of the hooded cobra" is situated in Nagaur. Spread over 36 acres, the fort was in a state of neglect till the 1980s. In 1985 the fort was placed in the care of the Mehrangarh Museum Trust. The fort has gradually been restored to its former glory with the support of four grants from the Getty Foundation, two from the UK-based Helen Hamlyn Trust and contributions from the Mehrangarh Museum Trust. The Palaces and historic spaces display period furniture, objects and an amazing group of wall paintings. In 2002 the Fort of Nagaur won the UNESCO Asia-Pacific Heritage Award for Culture Heritage Conservation. It was also shortlisted for the prestigious Aga Khan Award for Architecture in 2011-2013. The Nagaur Fort hosts the World Sacred Spirit Festival every year. The Pashupati Nath temple is a popular public attraction located in the Manjhwas village of Nagaur district in Rajasthan. This temple is believed to have been built by Yogi Ganeshnath in the year 1982. The Pashupati Nath temple stands at a distance of 20 kilometres from the Nagaur district headquarters on the Deh route. Dedicated to the Hindu deity, Lord Shiva, this temple has been built along the same lines as the Pashupati Nath temple in Nepal. The Shivalinga placed within the inner sanctum of this temple is made out of ashtadhatu, and four aartis are performed every day to worship the deity. People from near and far come to visit the Pashupati Nath temple in Nagaur on Shivratri and in the month of Shravan every year, making it a site of great religious significance. Jhorda is a quaint little village in the Nagaur Tehsil, and is quite well-known as being the birthplace of the poet KandanKalpit and of the great saint Baba Hariram. During the months of BhadrapadChaturthyandPanchmi (January – February), Jhorda sees over one to two lakh visitors each year.People visit from all over Delhi, Haryana, Punjab, Rajasthan and U.P. for the big annual fair that is held in the village each year. The village is also home to the Baba Hariram Templewhich houses a lot of memorabilia from the saint’s life. Being a celebrated shrine, Bade Peer Sahab Dargah in Nagaur was also opened as a museum on the 17 th of April, 2008. While the most popular display at the Dargah is a Quran Shareef written in golden ink is said to be written by Hazrat Syed Saiffuddin Abdul Jilani, along with his cane and headdress, the museum is also home to several other items of historical importance. Visitors can look at old Indian coins from 1805, as well as American coins with the image of Abraham Lincoln, among others. Located on Syed Saifuddin Jilani Road, the Dargah is a well-frequented destination amongst people of faith and history buffs alike. Just like Pushkar’s cattle fair, Nagaur also has a cattle fair. This colourful fair is one of the biggest in India it is definitely worth a visit as people gather from near and far. Many sports activities take place during the fair and thousands cattle, camels and horses are traded every year. Nagaur welcomes Sufi artists from all over the world every year as they perform at the Nagaur fort. The festival includes workshops, lectures, music and yoga sessions too. Seekers of spiritual enlightenment and Sufi music lovers alike attend this annual festival and celebrate the rich culture of Rajasthan. Engage in the many activities, tours and adventures that await you in Nagaur. There’s always something to do in Rajasthan. The closest airport is Jodhpur Airport which is 137 kms away. Buses are available from Jodhpur, Jaipur and Bikaner to Nagaur. Nagaur is connected via rail from Indore, Mumbai, Coimbatore, Surat, Bikaner, Jodhpur, Jaipur, etc.